VICTORY RECORDS To Host Stage At 2014 ROCKSTAR MAYHEM FESTIVAL! EMMURE to Headline! VICTORY RECORDS is extremely excited to announce its participation in the 2014 Rockstar Energy Drink Mayhem Festival! All summer long, Victory will present the Victory Records Stage featuring EMMURE, ILL NINO, ISLANDER, WRETCHED and ERIMHA. The stage will be headlined at 4:25PM each day by EMMURE, who will be touring in support of their new album, Eternal Enemies, out April 15th. This also makes EMMURE the first band to ever play Mayhem Festival two years in a row! 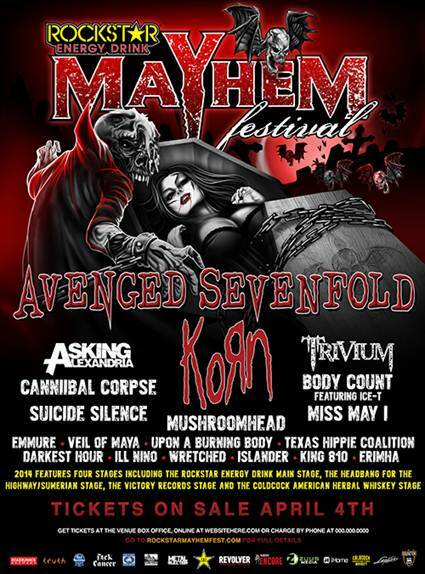 Please visit http://www.rockstarmayhemfest.com for FULL details! SWORN ENEMY has reformed and once again they continue their legacy with the addition of new guitarist Matt Garzilli, and bassist Mike Puccciarelli. The band has completed work on a new album Living on Borrowed Time that will be released May 13th via Rock Ridge Music/ADA. The album is available for pre-order HERE. Today the first single from Living on Borrowed Time is being premiered exclusively on Lambgoat. The song entitled “Hard Way” can be streamed HERE. North Carolina´s Gothic Heavy Psych Band BLOODY HAMMERS have confirmed a June 10th North American release date for their new album Under Satan’s Sun. (May 30th G/A/S, FIN & Benelux, June 2nd UK & Rest of Europe, June 4th ESP/SWE/NOR)The album will be released via Napalm Records/Spinning Goblin. The album will be available a regular CD, limited edition vinyl gatefold and digitally. Bloody-Disgusting the home of all things horror online is hosting an exclusive premiere of a new lyric video from BLOODY HAMMERS. The lyric video is for the song “The Town That Dreaded Sundown” and can be viewed HERE. A teaser for the album can be viewed HERE. 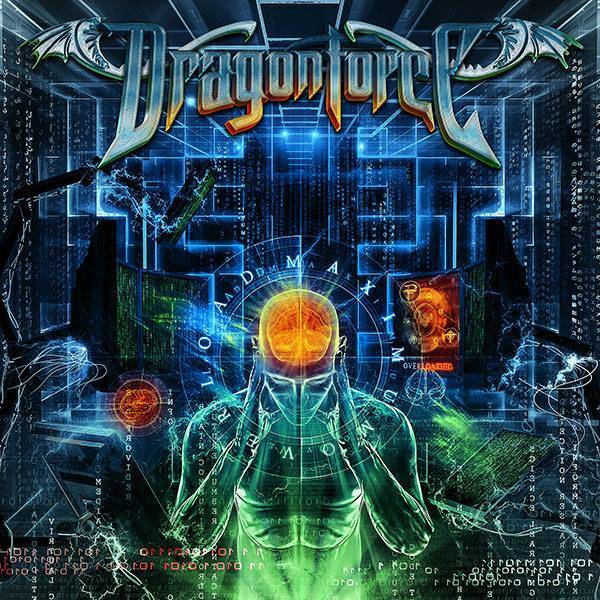 British epic power metallers DRAGONFORCE will release their new album, “Maximum Overload”, on August 19 in North America via Metal Blade and August 18 in Europe through earMUSIC, the Hamburg, Germany-based international rock label which is part of Edel Group. The CD was recorded at Fascination Street studios in Örebro, Sweden with Jens Bogren, who has previously worked with OPETH, THE DEVIN TOWNSEND PROJECT, AMON AMARTH, KATATONIA, SOILWORK and SYMPHONY X, to name a few. It marks the band’s first-ever album involving an outside producer, having historically opted to record themselves in association with Karl Groom. He continued: “The album title and album cover artwork is inspired by the constant bombardment of information we are subjected to during our daily lives. “Maximum Overload” will be released on standard CD, standard digital version, special edition CD with five bonus tracks and a bonus DVD, special edition digital version (same bonus material as special edition CD), and vinyl. The effort features a couple of surprises, notably a guest appearance on some of the songs from TRIVIUM‘s Matt Heafy. “We’ve always gotten on really well with the TRIVIUM guys and it was great when Matt had a couple of days to spare and agreed to weigh in on some of the songs,” said DRAGONFORCE bassist Frédéric Leclercq. “Maximum Overload” is the follow-up to 2012’s “The Power Within”, which was the band’s first with vocalist Marc Hudson. Since his live debut with the group in July 2011, Marc has gone on to front over 100 shows with DRAGONFORCE in 32 countries across the globe, including arenas with IRON MAIDEN as well as a mammoth headlining world tour to support the CD. “The Power Within” sold 5,800 copies in the United States in its first week of release to debut at position No. 74 on The Billboard 200 chart. At the time of this posting, the campaign currently sits at $27,897 CAD. You can find it over at Indiegogo.com. Says the group: “For 20 years we have given our blood, our sweat, and our tears. We have toured the world, met thousands of amazing people, traveled a million miles, laughed with you, cried with you, screamed with you, waited out in the cold with you, bled with you and grown up with you. We have defied the rules, the status quo and sometimes even each other. We have broken the mould by which metal had cast for us and sprinkled its shards kicking and screaming across 5 continents, 6 albums and thousands of shows. “So here is what’s happening, and what your contribution will be going towards. First, we will be compiling our personal footage, concerts and events over the past 20 years, to bring you the be all and end all of career-spanning KITTIE documentaries. We are opening up our archives to you; to give you an inside look at what it has been like to be in this band, through our eyes, for the last 20 years. From day one to the present: Recordings, shows, backstage…it’s all there. We will be entrusting My Good Eye Productions, a friend and the director of our last 4 videos, with the footage, to help us edit and direct. His fee, as well as travel, equipment, and crew costs over the next year will be upwards of $15,000. “We are also excited to announce that we will be working with Mark Eglinton, who has had recent success with Rex Brown of PANTERA’s book, to pen our band biography. This is the story you have never heard, and will not believe! To get Mark started on the process of writing and pitching to publishing houses, he will need $4,000. “The rest of the money will be used to print, design and manufacture all of the awesome perks you see at the [Indiegogo site]. We are once again opening up the KITTIE archives and raising the dead with old shirt designs, long-lost and out-of-print recordings, and rare and new items to give you a piece of where we came from, and a glimpse at where we are headed. “If, for some reason, we do fall short of out goal, the funds we do raise will still go to the making of the book and documentary. We are completing this project regardless, because we feel that we owe this piece of ourselves and our history to you. We will find a way to get this amazing project to you no matter the outcome. We always do. 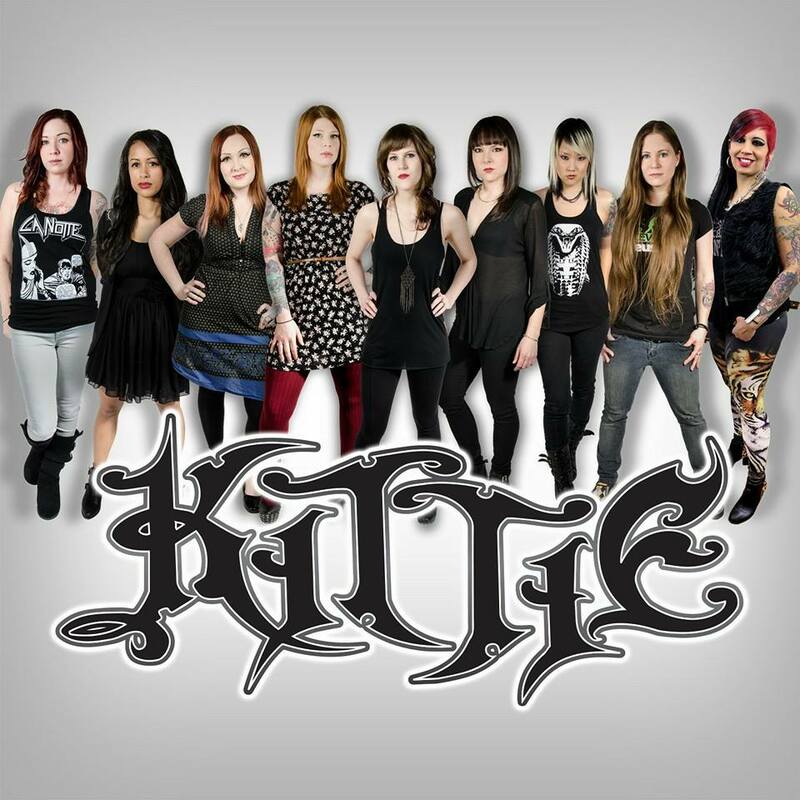 KITTIE released a best-of compilation, “Not So… Safe”, in September 2012 via eOne Music. The collection featured tracks from the band’s records “Spit” (1999), “Oracle” (2001), “Safe” (2002), “In The Black” (2009) and “I’ve Failed You” (2011). KITTIE’s latest album, “I’ve Failed You”, sold 3,000 copies in the United States in its first week of release to debut at position No. 178 on The Billboard 200 chart. KITTIE’s fourth album, “Funeral for Yesterday”, registered a first-week tally of 9,000 in February 2007 to enter the chart at No. 101. “I’ve Failed You” was released on August 30, 2011 via eOne Music. The CD was recorded at Beach Road Studios in Goderich, Ontario, Canada. 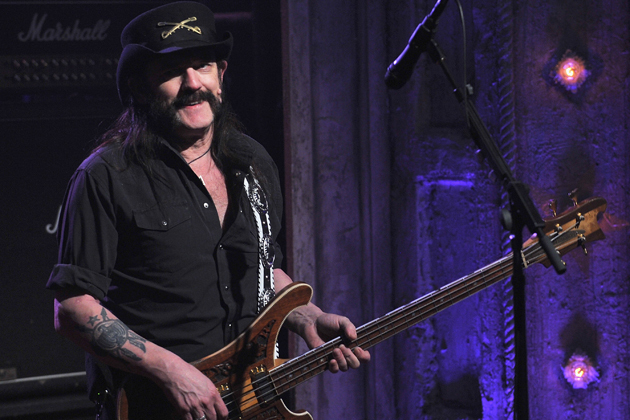 The band once again worked with producer Siegfried “Siggy” Meier, who helmed “In The Black”.